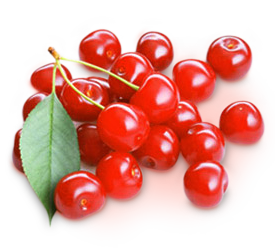 A Michigan State University study suggests that Montmorency tart cherries, the variety grown in Ontario, may inhibit pain and inflammation. The study compared the level and activity of anthocyanins found in a variety of fruits and berries. Anthocyanins can block cyclooxygenzse [COX], which carry messages throughout the body and signal pain and inflammation, and act as antioxidants to destroy free radicals. The yield of pure anthocyanins in 100 grams of tart cherries was the highest of the fruits tested and demonstrated COX-blocking activity comparable to ibuprofen at ten-times concentration.